Teachers in Littleton, Colorado -- like teachers in many places -- are increasingly asking students to read and write online. Free tools like Google Docs have made it easy for students to work on the same piece of writing at home and at school, and have allowed teachers to explore collaborative writing assignments and synchronous editing with students. There are also many digital tools that can support students as they learn how to read deeply, take well-cited notes, and navigate the writing process. While many teachers are finding efficiency in allowing students to write and submit assignments online, not all students or teachers want to use the exact same set of tools. 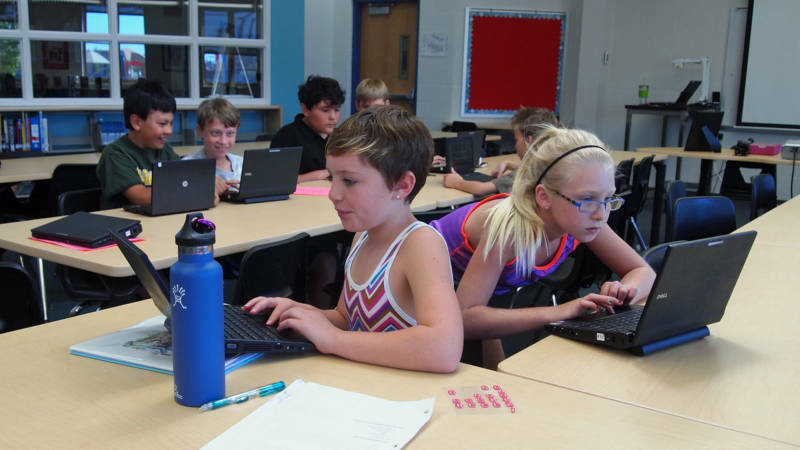 That’s why Littleton’s Instructional Technology Specialist, Dana Levesque, started compiling resources on a site that both teachers and students can access to find the tools that fit their needs. Levesque said she wants to make sure teachers and students are aware of tools that could help them, and to develop the agency to choose what works for them. Some students use many tools to bolster their writing and build skills, others don’t use any. The idea is to give students a toolbox they can continually return to both in school and in life beyond its doors. “Kids have different learning styles,” Levesque said. “Why should I make them learn in a way that’s not their strength.” She said often teachers let students know about the district’s sites for writing, reading and research tools at the beginning of school and then let them decide what will work for them throughout the year. Marissa Broyles taught English and social studies to a class or sixth graders who needed extra support last year. She experimented with many of the tools Levesque has compiled and saw how her willingness to be flexible as a teacher made her students feel supported. One girl with dyslexia could easily have been mistaken for being further behind than she really was because of how much she struggled with writing. “That was her only barrier, and it was so sad for me because she's one of the brightest students I've ever taught, but the dyslexia was really getting in her way," Broyles said. Broyles began allowing the student to use Screencastify, a Chrome extension that lets users record a video of what's happening on their screen while voicing an explanation. The student would pull up a digital copy of a book, for example, find evidence to support her claims, and explain her thinking orally. All her moves on the computer, as well as her exposition, were recorded, showing Broyles the complexity of her thinking. When Broyles presented to her middle school colleagues about the success of this approach she got push back from some teachers who wondered when the girl would learn crucial writing skills if she was always allowed to use the work around. “At that point I wanted to know her thinking," Broyles said. "I didn’t really care about the physical act of her writing, and I wasn’t scoring her on the writing." But at other times they did focus on the mechanics of writing, and the student did improve. But Broyles doesn't believe a student should have to write as a prerequisite to having ideas. Even better, the student learned to advocate for herself, identifying some assignments when Screencastify was appropriate and others when writing was necessary. That student is now entering seventh grade, where she won't have the same intensive support that she had last year, but Broyles feels confident that she now has a bag of tools to rely on for her assignments. And, since all students at this middle school have Chromebooks, no one has to know when she's using a support or not. Both Broyles and Levesque say the important thing is for kids to begin to think metacognitively about what they need to succeed in school and to advocate for what works. Not every student will use the same tools, but there are lots of powerful ones that could be the slight boost a student needs to feel successful. Graphic organizers are a common way teachers try to support kids to brainstorm ideas and organize them into cohesive arguments. But some students might not find graphic organizers inspiring or exciting, and since the ideas, not the worksheet are what is important, Levesque has compiled many tools kids might use to organize their thoughts. For example, some kids still prefer to write and draw ideas on paper, and there’s no reason why they shouldn’t do that even if their ultimate writing product will be digital. Students can easily take a snapshot of written thoughts to document them digitally. Or they could download a variety of visual templates Levesque has compiled or even use a tool like Answer Garden to generate a word cloud. “It’s just one more way to capture it,” Levesque said. Many students who struggle with writing get hung up when it comes to putting the first ideas to paper. But if teachers help them see drafting -- the first iteration of a writing piece -- as a separate step from editing, there are many ways to help students jump this initial hurdle. Voice typing could be one such strategy. "Just have the kid talk about their topic, and at least they can draft it out and then have time to edit,” Levesque said. After getting those initial ideas down, a student can spend time restructuring sentences and improving the vocabulary. Often having something to work with can make this process smoother and it helps students begin to see multiple drafts and editing as a crucial part of writing. Levesque also noted voice typing is good for students still learning English, especially because it can translate languages. “Drafting is for ideas and editing is where you’re going to start making sure all those ideas are right,” Levesque said. That’s why she often encourages students to “remove spelling suggestions” for documents in the drafting stage. When kids aren’t paralyzed by the squiggly red line indicating spelling mistakes it’s often easier for them to get their ideas down. At this stage, students are working to make their sentences crisp and clear and to use higher level vocabulary words to express their points. Levesque said many of Littleton’s teachers use a strategy called “find richer words” when students are editing digital documents. Right clicking on a word in Google Docs brings up a list of synonyms. The student can choose a richer word and make a note to the teacher about the word used previously. “We see a lot of teachers doing this so when they have time to edit [students] work they have a quick visual of what were those edits that they made,” Levesque said. This is also a good time to turn spelling suggestions back on and clean up any mistakes. Teachers can also look at the full revision history of a document to see the progression and changes a student has made over time. Many students have appreciated learning about revision history when they delete a paragraph and what to recover it in a later draft. Levesque has also written up careful directions for ways students can embed snapshots or images and then label them. In science, students will often take a picture of their lab station, upload it as a drawing, and then add arrows and text to label each element. “When it comes to writing, we’re changing our writing product to not just be a writing piece,” Levesque said. Teachers in her district are trying to honor the strengths of different students within the same assignment by assigning an artistic representation and an audio description alongside writing. “The reason this example stuck with me is maybe this kid's writing is not their strength, but wow did they showcase on their speaking part, or the art piece,” Levesque said. The writing is still important, but honoring the strengths of the whole child can give students confidence that their ideas will be understood. Teachers are also experimenting with publishing to more authentic audiences. In one assignment, elementary students published their art pieces online and high school students wrote poems based on that art before publishing them again. Levesque said the elementary students were thrilled that high school students had taken the time to appreciate, interpret and reinterpret their work. And having the same ideas bouncing around within the district in multiple mediums and multiple times strengthened the meaning of the work. Evaluating is important for both teachers and students. It’s important for students to be able to identify accurate sources and understand online permissions as they work on writing and multimedia projects. Levesque has put together some exercises teachers can use with students to get them in the habit of carefully evaluating the accuracy of online sources. And when teachers evaluate student work within an online environment they have a huge advantage; they can see the revision history and comments from students about their changes, which also have a time stamp. Levesque recommends teachers embed the rubric for an assignment at the bottom of a Google Doc so students know exactly what’s expected of them. Rubistar is an easy way to create a rubric. They can also give examples of specific skills they’d like to see so students know what’s expected of them. “These tools help scaffold reading for many of our readers who can’t access certain texts,” Levesque said. “Kids use tools they think they need." She has compiled a list of Chrome extensions that help kids access dictionaries and pronunciations they don’t know, as well as Speak It and Read&Write, which offer audio supports for students having difficulty reading text. “Some kids are using this a lot especially in content areas like science where there are a lot of vocabulary words,” Levesque said. Some teachers she works with no longer compile vocabulary lists for students. Instead students make lists of the words they don’t know with definitions and examples as they read. Levesque was surprised at how excited her high school teachers were to discover a tool called Rewordify, which allows students to paste a link and get back a version with simpler words and sentence constructions. When students hover over highlighted areas the original, richer text shows up so they can gradually build their vocabulary and familiarity with difficult texts. Levesque also recommends Newsela and the free and nearly identical tool Tween Tribune for non-fiction readings offered at various reading levels. The app offers texts in both Spanish and English. Research is a central skill for students and yet often teachers don’t give them questions that require the synthesis, analysis and critical thinking inherent in good research. Levesque has compiled resources to help teachers design “thicker questions” that push students to use multiple sources, analyze them, develop an opinion and connect to the real world. There are lots of useful digital tools to help students keep track of information they find online and to cite it correctly. The easiest is the research tool within Google Docs, which pulls up a whole list of resources related to any right-clicked word, and can be filtered by license or type of search. If students pull quotes, images or tables into a research document they’ll also get a link back to the original site and information about how to correctly cite it. Younger kids can get overwhelmed by text-heavy search results might enjoy using Instagrok. This tool will return a concept map related to the topic, instead of text heavy articles. That could help students plot a roadmap for their research without getting overwhelmed and frustrated. Levesque finds students are often most appreciative for little tips or tricks that make their researching more efficient or less frustrating. For example, they were thrilled when she told them that if they accidentally closed a tab in Chrome they could re-open it by right-clicking on the previous tab and selecting “reopen closed tab.” Students can also “pin tabs” that they are continually going back to so they don’t accidentally close them. A frustrating moment like that can discourage students from continuing with their research, and little tricks help smooth the process. “Being aware of the small things that help with transitions my students say are crazy important,” Levesque said. For example, students were thrilled to learn about “bookmark all tabs” for those moments when they have ten tabs with research open and the bell rings. It helps them save all the research they’ve carefully found and they can open them all easily next time they need their work. Above all, Levesque wants to build self-confidence in students and teachers around helpful tools. After that, it’s up to the individual to own what strategies are helpful and which can be ignored.